The name 'Blacktop' is given to the 5th generation of the 4A-GE engines. It's not an official name that Toyota gave to the engine, but something Toyota enthusiast came up with to distinguish this generation of the 4A-GE. The reason for the name is pretty obvious: The valve covers and protectionplate between them are all black. This makes it pretty easy to recognize from the other 4A-GE variants. After the 4A-GE engines with 16 valve heads couldn't really be improved any further, Toyota decided to develop a whole new cylinder head for the engine. But this time it was fitted with 5 valves per cylinder. 3 Intake valves and 2 exhaust valves. A Toyota 4A-GE 20V engine with the black valve covers and protection plate. This generation of the 4A-GE was a further improvement over the 4th generation, that was also already fitted with a 20V cylinder head, the so called 'Silvertop'. The main differences between the two are amongst others: The Blacktop used a MAP sensor, it has lightened internals, bigger and different shaped intake ports and a even higher compression. It has a improved and more advanced VVT system on the intake camshaft but both engines feature a ITB intake system. When these engines were made, they were already pretty advanced. A cylinderhead with 20 valves and a intake system with Individual Throttle Bodies was something found more in all out race cars than in something road going and meant for everyday use. let alone in something as simple as a Toyota Corolla. But to be able to compete with Honda's V-TEC engines, Toyota had no choice and had to resort to drastic measures to make their 1600cc engine stand out. And I for one am glad that they did as driving a car with a Blacktop engine is a wonderful sensation. The biggest attraction is the noise they make due to their high revving nature and the throttle bodies on the intake. 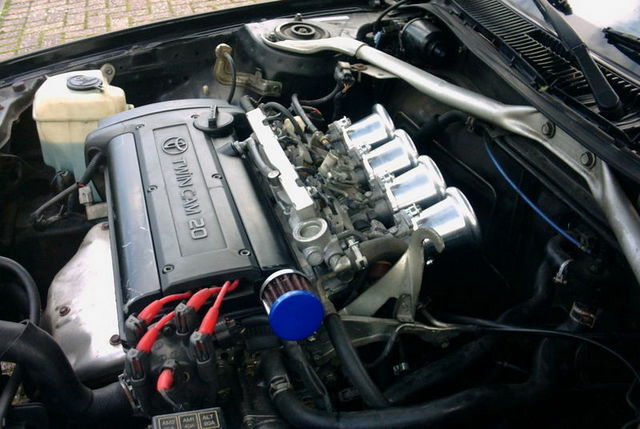 The Blacktop engine was sold mainly in cars for the Japanese domestic market and could be found in the AE111 Corolla Levin and Sprinter Trueno models (The AE111 was produced from 1997 to 2001). These coupé models of the AE111 model are in fact the direct decedents of my own AE92 coupé. The Blacktop remains to be a very popular engine for engine swaps and has been swapped in to various other chassis. +/- 160 hp @ 7800 rpm. 162 Nm @ 5600 rpm. This 5th generation of the 4A-GE was also the last. After this engine, the development of the 4A-GE was stopped. Toyota moved on to a newer and more modern engine design as there was nothing more to gain from the 4A-GE that just couldn't meet the stricter emission regulations. The 2ZZ-GE engine was the future for the next generation of sporty Toyota's.